Arrived in Whitehorse at about 6:30 p.m. on July 16. We had dinner and went to Frantic Follies Vaudeville Revue, which was great. The show featured singing, can-can dancing, slapstick skits and readings of Robert Service poetry held at the Westmark Hotel. Now in its 39th season, the show entices viewers to put themselves into the spirit of the Klondike Gold Rush. Just like the Sourdoughs who came in from the creeks, loaded with gold and eager for entertainment. Gasoline was $4.44 CD a liter or about $6.00 per gallon USD. 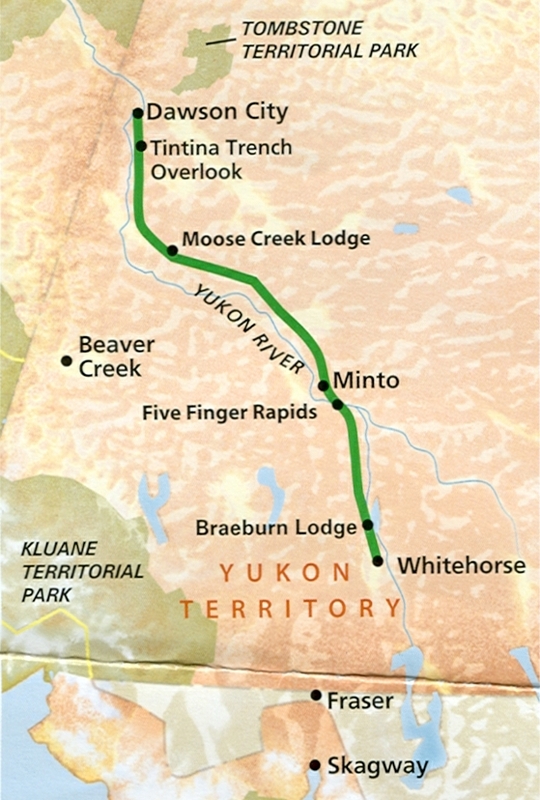 We stayed one night in Whitehorse and the next morning we were told to expect an 8 hour coach ride on the Klondike Highway that follows the route of the old Overland Trail to Dawson City, Yukon. First stop out of Whitehorse was Braebun Lodge which had huge cinnamon buns – about 8-10 inches across. We passed through Carmacks, following the Klondike River past Fox Lake and stopped at the Five-Finger Rapids. Lunch buffet was at Minto, a campground stop along the banks of the Yukon River. We did stop for a look at the Tintina Trench just before Dawson City.